Increase trade sales whilst reducing staff time on sales and ordering. ProBuild raises your sales activity, improves your service levels and reduces your staff ’s workload by automating your online sales, ordering and marketing operations. With ProBuild you can design your sales campaigns and build your online shop in a fraction of the time it would take with ecommerce solutions and at a much lower cost. So let’s start building the future together! Sales and ordering couldn’t be faster or more convenient ProBuild targetted email campaigns and automated ordering takes your offers to customers. – allowing them to order with just one click, 24 hrs a day on mobile, tablet and computer. ProBuild provides a full audit history of transactions, with instant confrmation so your sales staff and customers know exactly what’s been ordered, it reduces errors and improves customer service..
You can manage and administer centrally or give your sales team their own easy to use sales platform. 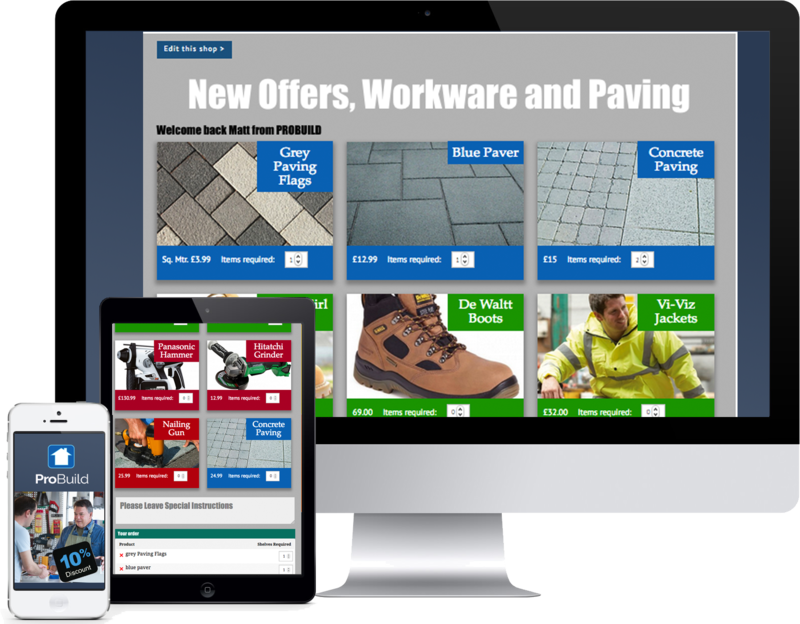 ProBuild has been developed to give building suppliers a cost effective, easy to operate online sales solution without the expense of a bespoke retail website. Whether you’ve a single store, several locations, or an expanding chain, ProBuild is the sales solution for trade business. Let’s start building the future together!